Happy Friday everyone! To celebrate this glorious end to a long work week, I thought I'd share some of my very favorite things with you. Enjoy the pretty! 1. 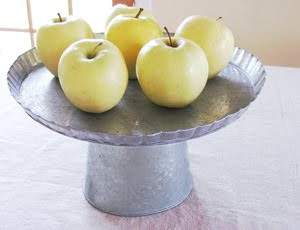 This glorious galvanized cake stand from Farmhousewares.com. This Web site is completely amazing in itself, but I'm in LOVE with this pedestal! It's a little pricey for me right now, but I'm saving up (and secretly hoping one of the handy 15% off coupons the owner posts on her blog will come soon!). This would (aka will eventually) look fabulous in my kitchen! I scored this beauty at Hobby Lobby half price for $20. I just adore it. Moss, nest and eggs are from Hobby Lobby as well. I plan on changing it out with the seasons. As cute as my little terrarium is, I've seen it on clearance now and I can't figure out why no one wanted it! Oh well, it's just as cute as it can be! 3. My $3 Goodwill shelf. This was my lucky find from the Andover Goodwill for $2.99! I have to say I've been very inspired by this blog to start thrifting. I was never much of a thrift/junk shopper until recently, but because of several blogs I've been following, I've started hitting the DAV and Goodwill more regularly. And it has paid off! I just love the patina on this. I'll show you my best thrift store find soon! So Pottery's Barn's just a little out of my price range, but I love these pillows! 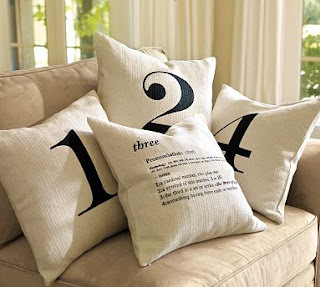 I bought some burlap at Hobby Lobby I'd love to recover an old pillow with and then paint on a number. Only two problems ... I don't sew and I can't find a large number stencil. Could be a problem but I'm sure I'll figure something out! I'm loving everything with a number on it right now, if I can find it. It's so difficult to find unique things like that in Wichita. I'm pining over all the gorgeous stuff at Round Barn Potting Co. Amazing! My mom gave this to me for Christmas and it may be one of my most favorite things I own. I love anything with bees (except not the cutesy/cartoony kind, but the vintage/French kind) and she knew I'd love this the moment she saw it. And she was right! Plus, I've not seen anything like it anywhere else. I love how unique it is. Thanks, Mom! Well, I think that's it for my current Favorite Things list! Check back next Friday for more favorites. Now tell me, what are your favorite things? I love your terrarium! I missed out on a really great one at HL because I wasn't sure where to put it. As to the PB pillows, lots of people have been doing knock offs of them so I'm sure you'll be able to find a tutorial. Try freezer paper stencils - you make you own stencil and it's easy. Glad I could contribute to your favorite things!! Courtney, thank you so much for the mention. I'm loving those pillows too.